A 70-year-old man underwent a T9-T10 facetectomy with instrumented back fusion. Postoperatively, he developed a bowel obstruction and was found to have a rectal squamous cell carcinoma. Emergency resection was performed followed by chemoradiation. A follow-up PET/CT was obtained 4 months’ status post-resection, which demonstrated suspicious uptake around the thoracic spine hardware. The ordering physician was notified of a potential hardware infection, but at that time, the patient was asymptomatic and had been recently seen in clinic without any evidence to suggest infection. Within 1 week following the PET/CT, the patient presented with a new abscess and drainage from his incision site. Erythrocyte sedimentation rate and C-reactive protein were both elevated. Cultures from the abscess grew methicillin-resistant Staphylococcus aureus. The patient was taken back to the OR for debridement and hardware removal. He eventually made a full recovery after a prolonged course of antibiotics. On a 4-month follow up PET/CT (Figure 1), evaluation of the contrast-enhanced CT was limited due to artifacts from hardware. Fused PET/CT (C, D) and standard attenuation-corrected (AC) PET images (E,F) demonstrated increased FDG uptake in paraspinal muscles and central canal around the T9-T10 hardware as well as increased uptake in the left 10th costovertebral joint. Careful review of the non-attenuation corrected (NAC) images (G, H) demonstrated persistent uptake in these areas consistent with a pathologic process. 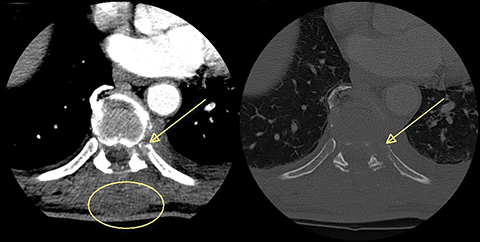 A dedicated CT scan (Figure 2) demonstrated new erosive changes in the head of the left 10th rib (A, arrow) and subtle edematous changes in the paraspinal muscles and posterior soft tissues at the T9-T10 level (B, oval). He underwent emergency removal of the hardware and was treated with a 9-week course of IV antibiotics. The primary differential includes metastasis from known colorectal cancer, primary malignancy, or infection. Colorectal metastasis is least likely in the spine and synchronous primary is also least likely in surgical bed. Given the patient’s recent surgical history, the patient’s primary physician and oncologist were notified of a likely hardware infection. Attenuation is a major issue in PET imaging, even more so than traditional CT or SPECT imaging, in part because PET requires simultaneous detection of two coincident 511 keV photons released by the annihilation of a positron produced by F18 beta-decay, which increases the likelihood that attenuation will affect the image.1-2 In PET/CT, x-rays from a CT scan are thus used to construct an attenuation map of density differences throughout the body, which can subsequently be used to correct for the absorption of photons emitted from 18F-FDG decay.1-4 Metallic implants such as dental fillings, hip prosthetics, or chemotherapy ports result in high CT numbers and generate streaking artifacts on CT images because of their high photon absorption. This increase in CT (or Hounsfield) numbers results in correspondingly high PET attenuation coefficients, which lead to an overestimation of the PET activity in that region and thereby to a false positive PET finding.5-8 NAC images do not manifest this error. Close inspection of the CT data and NAC PET data should permit accurate detection of any abnormal activity within the surrounding tissue. However, with the use of newer PET viewing software, many radiologists do not routinely review NAC images. This case demonstrates how a basic understanding of physics ultimately improves our patient care. In our case, the uptake around the spinal hardware may have been incorrectly attributed to AC artifact. However, review of NAC images also showed intense uptake in this region, indicating this was true FDG uptake; in our case due to infection. This case also highlights why review of NAC images remains imperative in PET/CT even though newer PET viewing software often does not display these images. Close inspection of the NAC PET data also remains imperative in correctly identifying pathologic uptake in the skin as well as small lung nodules. With appropriate IV antibiotics and prompt removal of the infected hardware, this immunocompromised patient was able to survive a potentially fatal infection. Kapoor V, McCook BM, Torok FS. An introduction to PET/CT imaging.RadioGraphics. 24:523-543, 2004. Pinilla I, Rodriguez-Vigil B, Gomez-Leon N. Integrated FDG PET/CT: Utility and Applications in Clinical Oncology. Clin Med Oncol. 2008;2:181-98. Epub 2008 Sep19. Saif MW, Tzannou I, Makrilia N, Syrigos K. Role and cost effectiveness of PET/CT in management of patients with cancer. Yale J Biol Med. 2010 Jun;83(2):53-65. Tirumani SH, Kyung WK, Nishino M, Howard SA, Krajewski KM, Jagannathan JP,et al. Update on the role of imaging in management of metastatic colorectal cancer.RadioGraphics. 34:1908-1928, 2014. Cook GJ, Wegner EA, Fogelman I. Pitfalls and artifacts in 18FDG PET and PET/CT oncologic imaging. Semin Nucl Med. 2004 Apr;34(2):122-33. Rosenbaum SJ, Lind T, Antoch G, Bockisch A. False-positive FDG PET uptake – the role of PET/CT. European Radiology. May 2006. 16(5): 1054-1065. Truong MT, Viswanathan C, Carter BW, Mawlawi O, Marom EM. PET/CT in thethorax: pitfalls. Radiol Clin North Am. 2014 Jan;52(1):17-25. Epub 2013 Sep 11. Abdoli M, Dierckx RA, Zaidi H. Metal artifact reduction strategies for improved attenuation correction in hybrid PET/CT imaging. Med Phys. 2012 Jun;39(6):3343-3360. Capobres TR, Dalal I. Hardware infection. Appl Radiol. 2018;47(7):40-41. Prepared by Dr. Capobres while a radiology resident (PGY-3), and Dr. Dalal while a practicing as a board-certified diagnostic radiologist and nuclear medicine physician, Senior Staff, at Henry Ford Hospital, Henry Ford Health System, Detroit, MI. Dr. Dalal is also Clinical Assistant Professor at Wayne State University, Detroit, MI.